I was happy to hear from this family when they found out that they are having a new family member! I met the mom 5-6 years ago when I was hired as a wedding photographer at her friend’s wedding. I really appreciate that they remembered me for when they were looking for newborn pictures in Portland and contacted me. 🙂 When she came over to my studio for a consultation before the session, we talked about what kind of pictures she likes and art she is looking for. We also talked about her maternity life and listened to how she and her husband are so excited to have the little girl! I believe it is important to know what they like and expect to get from our newborn session. We used to not have the consultation when we started offering newborn pictures in Portland. However, now I think that it is a pretty important step to make a smooth session plan for my client. As you can see from my photography I have on my website, I have my own taste in art. Photographing someone is how I feel the moment with the person, imagining their feelings and capture it for the person and their family. I believe when the feeling, the technique, and the moment meet, I can take a great picture. Some people may think that photographers are just clicking the button with a hope to get some pictures, but I believe they shouldn’t be if it’s a professional photographer. I realized having a consultation before the session makes for a good start in a relationship with my clients. Especially, for newborn sessions, clients can meet me, who is going to take care their precious baby to photograph, and I also can learn what they want for their session. 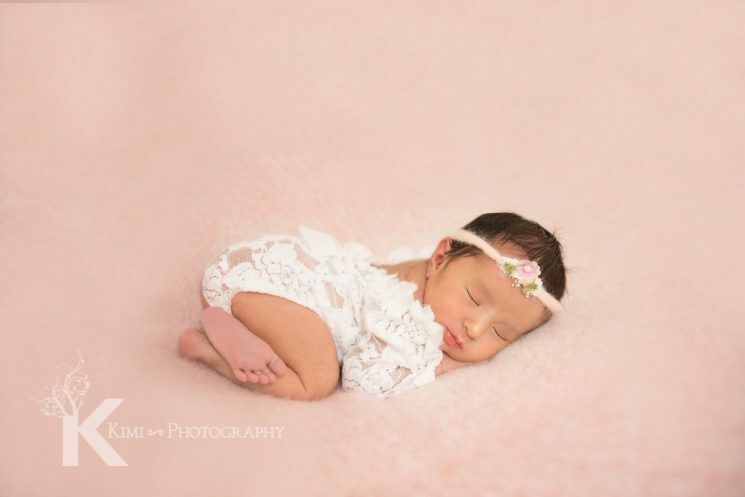 For newborn session, not only the mechanical technique, but the photographer has to know the technique to let the baby pose in a safe way. The baby is standing on this picture. 🙂 There is no way she can hold her head like the picture at a week old. I composed the 2 images to create this image. The mom bought this lacy romper for her baby when she found out the gender. I am so glad that the baby could pose very well on the beanbag! The baby girl did such a good job with posing! She was very flexible! Since the mom took some time for a consultation and prepared for the photo session ahead of time, we could take a lot of images and I believe I could meet their needs. I am hoping to see them for the baby’s 1st birthday!